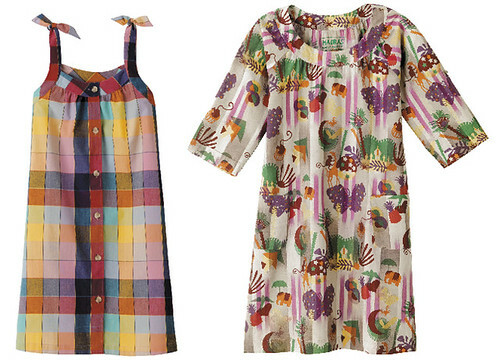 I’ve been thinking about these adorable summer dresses designed by A.P.C. obsessively for the past 24 hours. Lovely Chelsea over at Frolic! posted them last week. The more I stare at the dresses I have visions of myself sewing similar versions. I can’t say I’ve made really anything besides a pillow but why not give it a try? I found two cute dress patterns on Simplicity’s website. I just need to find a pattern that looks more like the button shirt dress version on the left. I think what I love most about the dresses is the fabric. Feels vintage and totally 70’s. Does anyone know any great madras plaid sources online? Can I Sew My Own Liberty Print Dress? These patterns are just so perfect!! I wish I could sew…the APC versions are wonderful, but just too pricey! You might check out the Built by Wendy patterns I've linked to here, also on the Simplicity site – she has a button-front dress that I'm thinking you can easily adjust to be sleeveless. I just bought that Cynthia Rowley pattern. I'm using the one with the cinched waist as inspiration to create my own version of a $300+ Tucker dress. I've made dresses for my girls, but never grown-up clothing. Fingers crossed. For fabric, you might want to check out Denver Fabrics. The site is enormous, but they have a great selection (although I'm not sure what they carry as far as madras goes). Good luck!